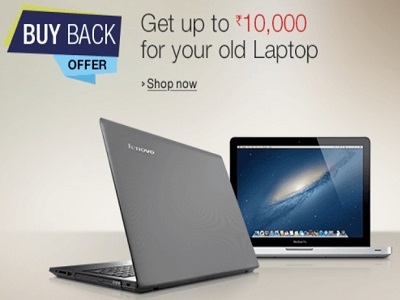 Now Amazon.in brings you Buy back offer on laptops through which you can get up to INR 10,000/- for your old laptop and get the same amount off on your new laptop. You can grab the new one over the listed special discount price. EMI and cash on delivery are further applicable. Amazon.in has selected about 75 laptops under this offer. You could sell your old laptop and purchase new one from selected models. Hurry up. Chennai: Get rid of your lazy old laptop right now and get surprising price up to INR 10,000 on it. Yes. Amazon.in makes it possible at ease. Purchase your passionate model among the selected models from different brands and sell your old laptop. Along with special discount on new one, valued amount of old one gets off.